If you're assembling a home theater, plan on including a subwoofer. Subwoofers are a crucial part of the home theater experience. The subwoofer provides the bass making the entire soundtrack feel larger, fuller, and more realistic; it gives special effects like thunder or explosions with a window-rattling punch, sound you can actually feel. 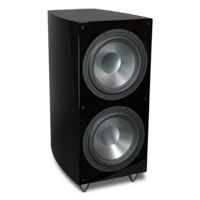 A subwoofer is also a wonderful way to enrich music listening, it can round out all types of music. Subwoofers come in two basic types, passive and powered. The passive subwoofers are powered by an external amplifier, in the same fashion as other speakers in your system; the powered subwoofer has a self-contained amplifier which powers the subwoofer taking a lot of the power load away from the amp/receiver and allows the amp/receiver to power the mid-range and tweeters more easily. 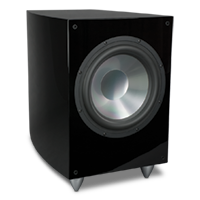 Additional subwoofer design variations include front-firing, and down-firing, and the use of ports or passive radiators. 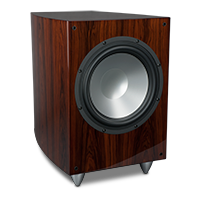 Front-firing subwoofers employ a speaker mounted so that it radiates the sound from the side or front of the subwoofer enclosure. 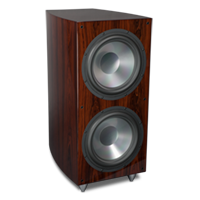 Down-firing subwoofers employ a speaker that is mounted so that it radiates downward, towards the floor. In addition, some enclosures employ an additional port, which forces out more air, increasing bass response in a more efficient manner than sealed enclosures. Another type of enclosure utilizes a Passive Radiator in addition to the speaker, instead of a port, to increase efficiency and preciseness. Passive radiators can either be speakers with the voice coil removed, or a flat diaphragm.